Thought this might make an interesting little separate topic for the Fashionista's and Francophiles amongst us. Can't remember if I've mentioned the Loris Azzaro H900 before on our forum, but I distinctly remember a short thread I wrote on RLT. Because it's Sunday afternoon and I'm feeling lazy, what the heck - I'm just going to copy and paste my original content. and the grossly over-priced Cartier Ferrari Formula chronographs (powered by Ferrari Cal. 531). I came across yet another variant earlier this week - from French fashion brand Loris Azzaro. 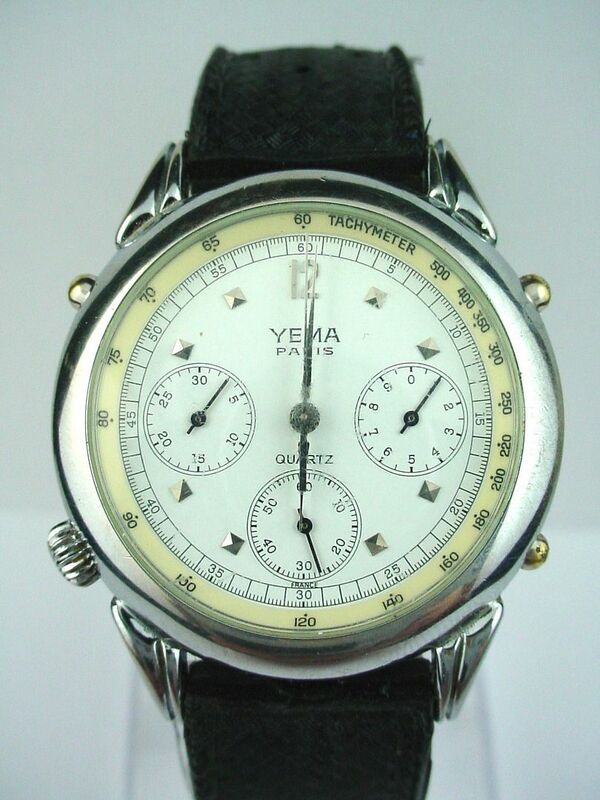 It's very obviously (to my eyes, at least), another 'parts bin special' from Yema (Compagnie Générale Horlogère). 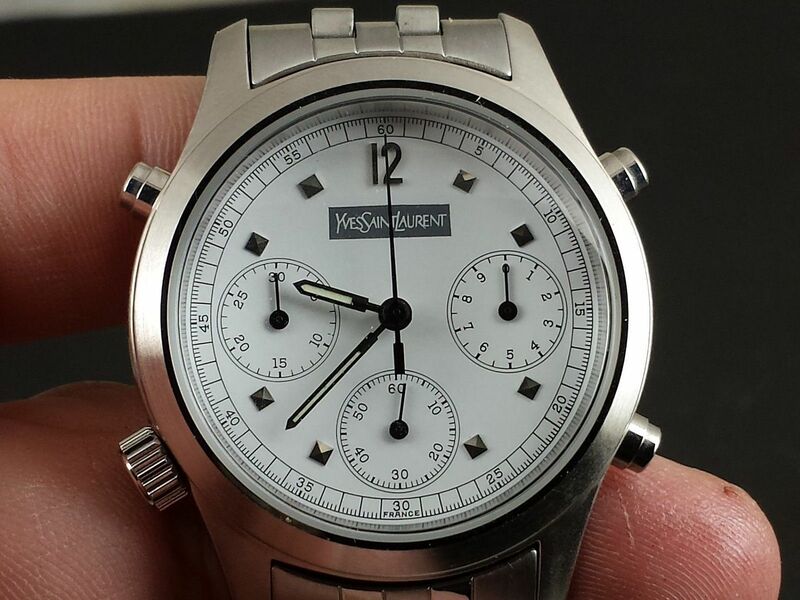 which, without any markings, removes the anomoly of the incorrectly marked rotation of the Kamatz bezel. the small diameter dial design bears a close family resemblance to some Yema models, Jaz and Kamatz 7A38's. apart from his ridiculously over-ambitious asking price of €315 Euros. Perhaps he knows something I don't. Apologies for the slight delay in completing this post. When I came to upload these photos to my PhotoBucket, 3 of the 4 (not the instruction sheet) were already in the folder, so I've been scratching my head, trying to remember where I might have posted them. Taken at face value, it looks pretty unique. Google J39024-50 with either Orient or Racer and the only relevant results returned are from the original milanuncios.com advert. But analysing it more critically, certain elements of the watch begin to look all too familiar. 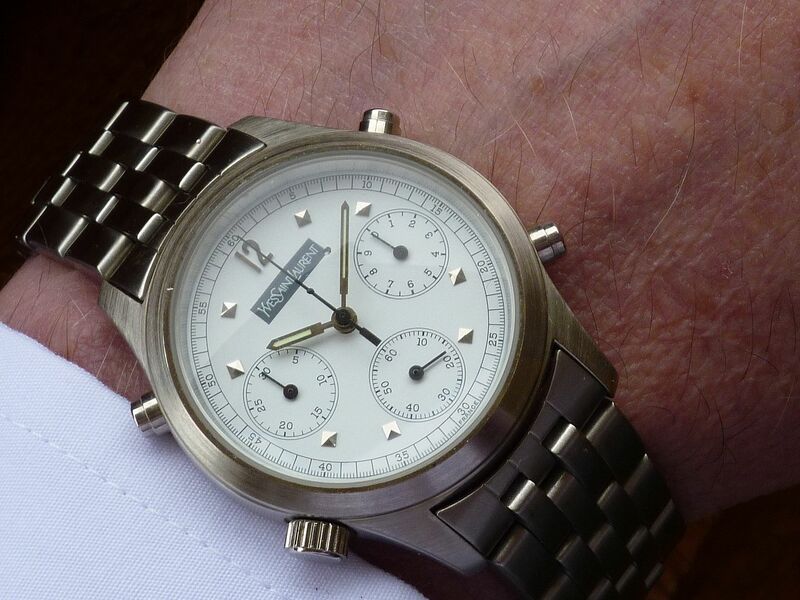 I may be wrong in condemning this watch, to use Lawrence's phrases, as a 'parts bin' factory-built franken, but the gold-plated 18mm lugged watch case bears an uncanny resemblence to that of Steve's Puma Y19904-50. 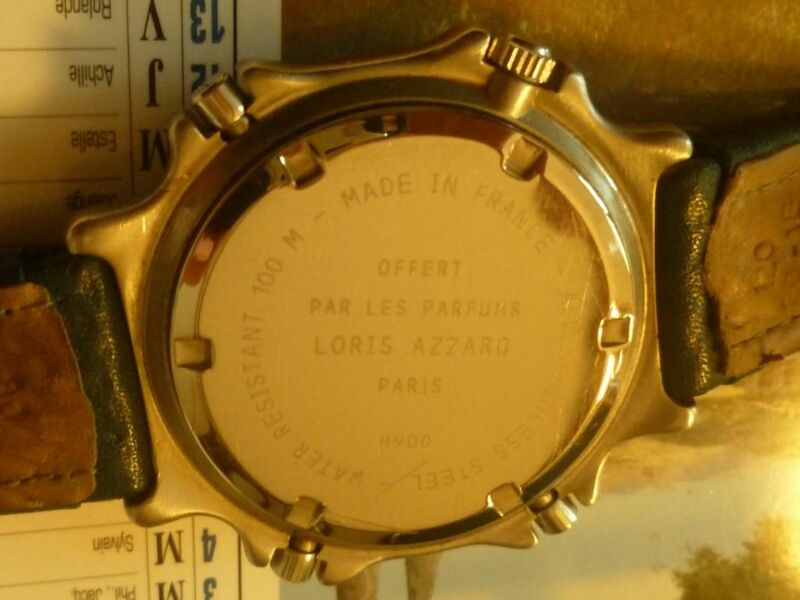 Not only that, but the presumably fixed bezel looks very similar to that fitted to the Loris Azzaro H900 (a limited edition customized Kamatz, made as a marketing promo by C.G.H.). I must admit to some feelings of remorse, not having purchased that Loris Azzaro, but the French seller wouldn't budge on price. Needless to say, I've never seen another exactly like it since. But what you may ask might prompt me to write about it now, years later ? Well I've found another. Or should I say .... it found us. This site get visitors from all over the globe. I don't think there's a single country we haven't had a visitor from in the last two years. But I'm still intrigued as to the reasons they may be arriving at the site and the topics they home in on, hopefully finding the answers. Especially incoming search links (which thanks to Google's recent change to encrypted secure searching are few and far between). 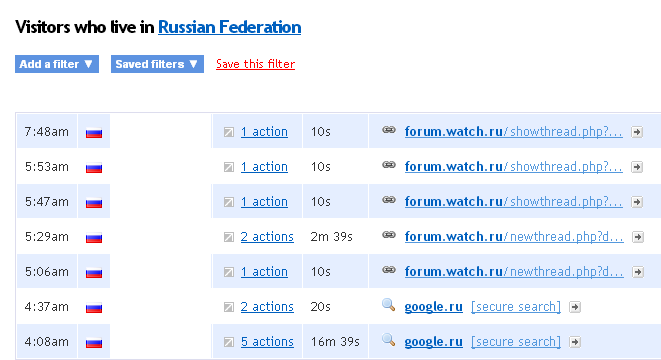 This afternoon I'd noticed an increase in traffic from Russia. This is the thread that has us linked: http://forum.watch.ru/showthread.php?t=206283 a For Sale advert by a poster from Kemerovo. Часы произведены Yema для YvesSaintLaurent, основаны на модели Yema N7. Самое интересное в них - механизм Shimauchi V.905, который является полным аналогом легендарного Seiko 7A28 - первого в мире целиком кварцевого хронографа (1982 год;). 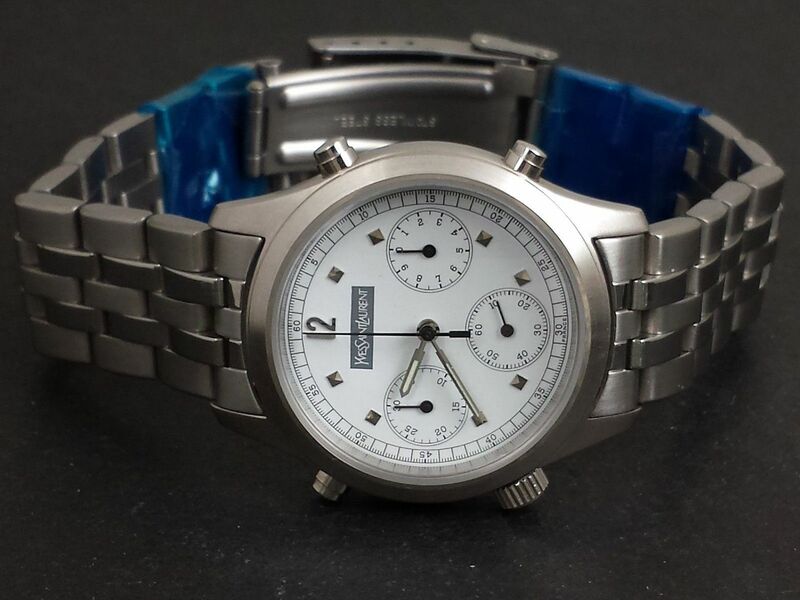 Yema использовали его в период сотрудничества с Seiko. 15 камней, регулируемый механизм (шаг регулировки 0.26 сек. в сутки;), полностью металлический. Может послужить донором для других часов на 7A28. Часы в пленках, не носились. Отправлю в любой регион. 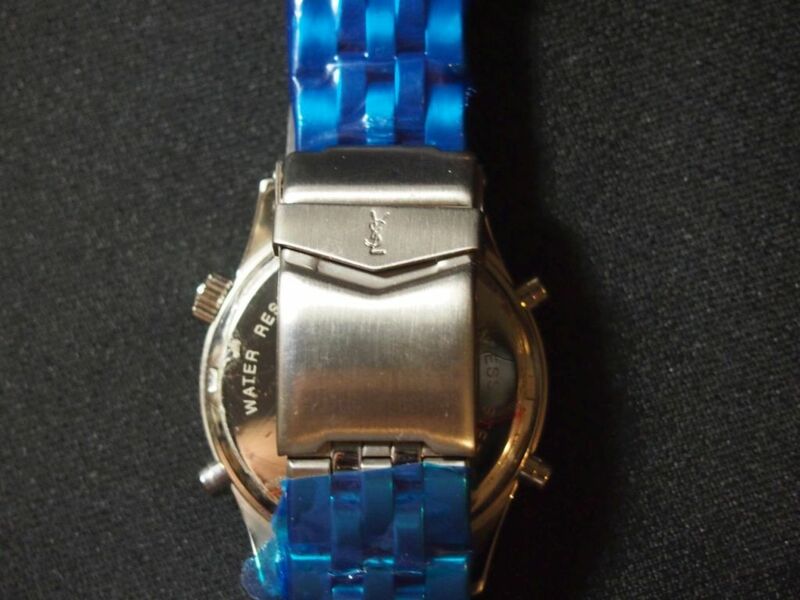 Yema watches made ​​for Yves Saint Laurent, based on the model Yema N7. 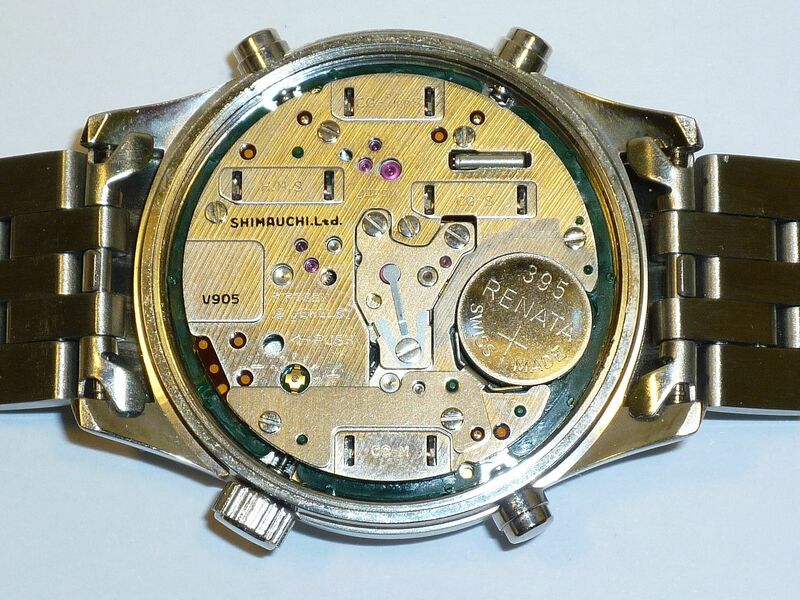 The interesting thing about them - the mechanism Shimauchi V.905, which is a complete analogue of the legendary Seiko 7A28 - the world's first quartz chronograph movement entirely (1982). Yema used it during the period of cooperation with Seiko. 15 jewels, steering mechanism (step adjustment 0.26 sec. per day), all metal. Can serve as a donor for other 7A28 watches. More about films, not worn. Send in any region. Should the dial design not look familiar to you, all you need to do is look at the first page of the Yema N7s and N8s spotted thread. It's basically the same dial used in the Yema model # N71X31/32/33 but with an YVES SAINT LAURENT logo instead of YEMA PARIS. so presumably of correspondingly smaller diameter. The seller's asking price of 4500 Roubles equates to only $128 US / £78 GBP (it's NOS) so I supect he'll find a buyer fairly quickly. Hopefully one who will treasure this little watch for the rare N7 variant that it is - not to use as a donor for a common Seiko 7A28. 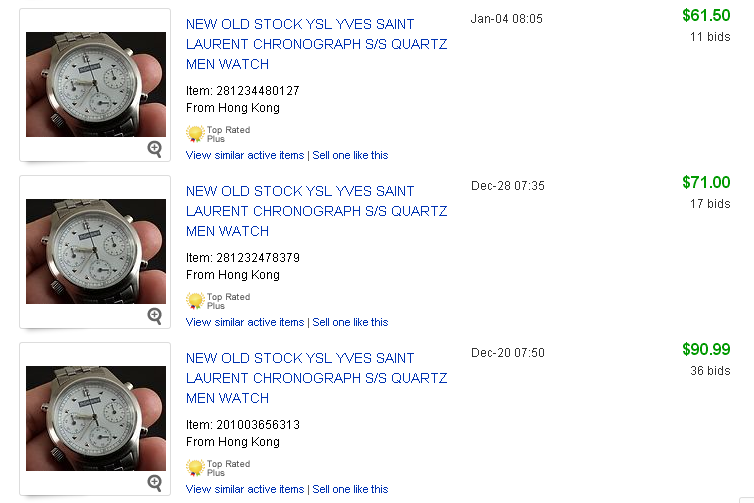 Or perhaps these YSL branded Yema N'7's aren't quite as rare as I might have first thought. 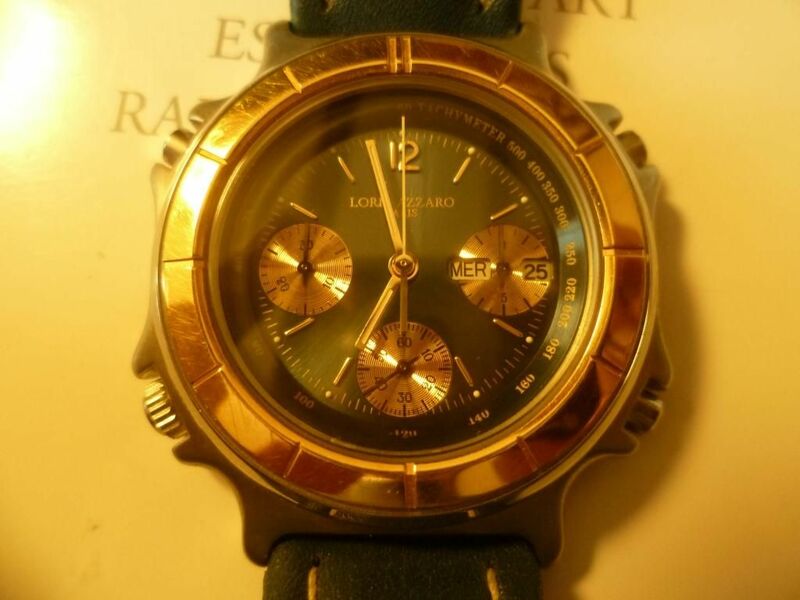 Certainly not as rare as the Parfums Loris Azzaro H900 anyway. Because I've just done a quick google on them. I'll just upload half of the dozen images included in his listing, because many, especially the head-on shots are very similar. 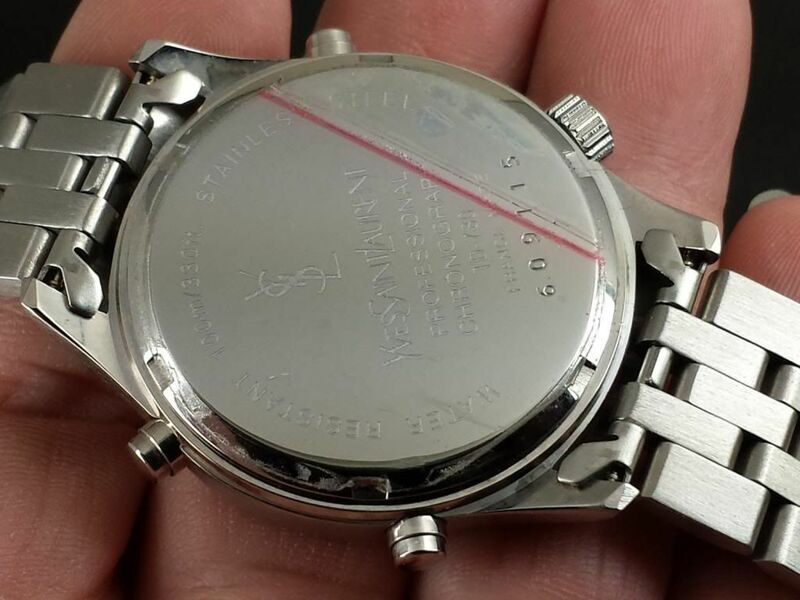 But the serial number in the above photo: 609115 didn't match that of the Russian watch forum seller's: 609208. That found 10 of them listed by neverstrong between November last year and January 2014, including the most recent listing ! These things aren't rare at all - going by recent eBay appearances. They're nearly as common as 7A28-7120 RAF Gen 1's !! Shipping to USA only $9.00! I'm bidding! Joking aside, for a minute, Paul - a pause for serious thought. 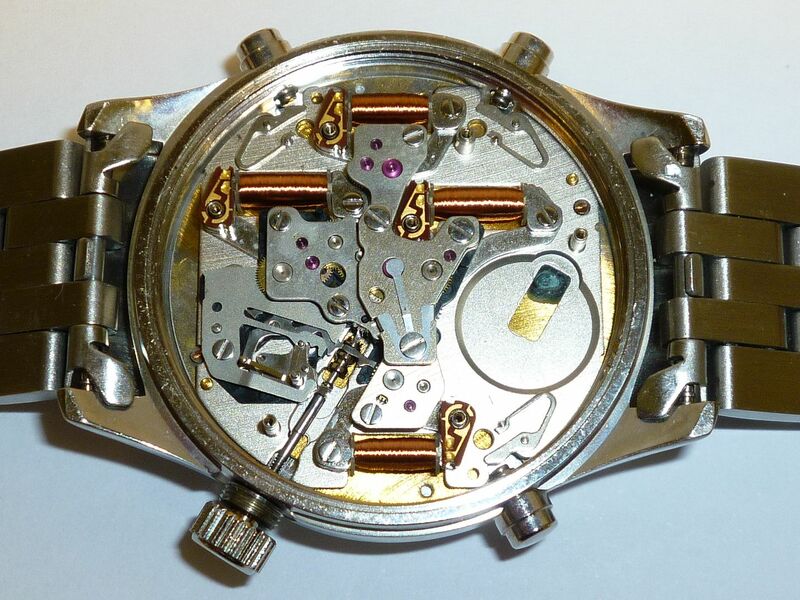 Fashion watches, particularly those coming out of the Far East are a prime target for replica watch manufacturers - i.e. Fakers. I can't remember who it was, or where they posted (likely in the eBay section), but a recently-joined new forum member asked the question, quite innocently: Are there fake 7Axx's out there ? I think my confident reply was that I'd never seen any evidence of them. I don't believe these are fakes. 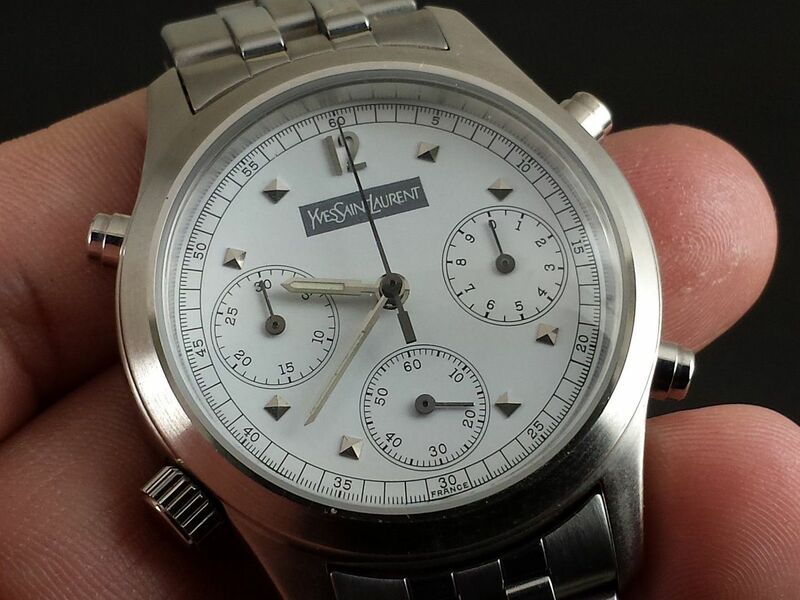 If you look closely at both seller's photos, there's evidence of slight degradation of the hands lume. Not the sort of thing you can fake. The case-back engraving looks pukka to my eyes and the solid link bracelet looks very workmanlike. I suspect neverstrong has got hold of a batch unsold old stock. Likely these were produced for YSL by Yema (C.G.H.) just like the Loris Azzaro H900 was. Question is: how many has he already sold, prior to November last year - and how many does he have left. The last thing we want is for forum members to be out-bidding each other in a scramble to get themselves a cheap 7A28. As usual our fearless leader brings us back to reality. I too looked at the case back engraving and had reservations. The hands do have the look of ageing well which also led me to believe that it could be legit. The oversize crown was the tipping point for me. That is so "Yema-French." Which begs the question in my mind 'do I really need another 7A28?' Nope! I'm out! Besides I like black dials! Besides - I'm the current high bidder ! I just bookmarked the next one up ! Bookmarked and nicely sniped in the closing seconds, Don ! Thanks Paul, out of 10 only one was sold for a lower price and one for the same $71---We will see ! 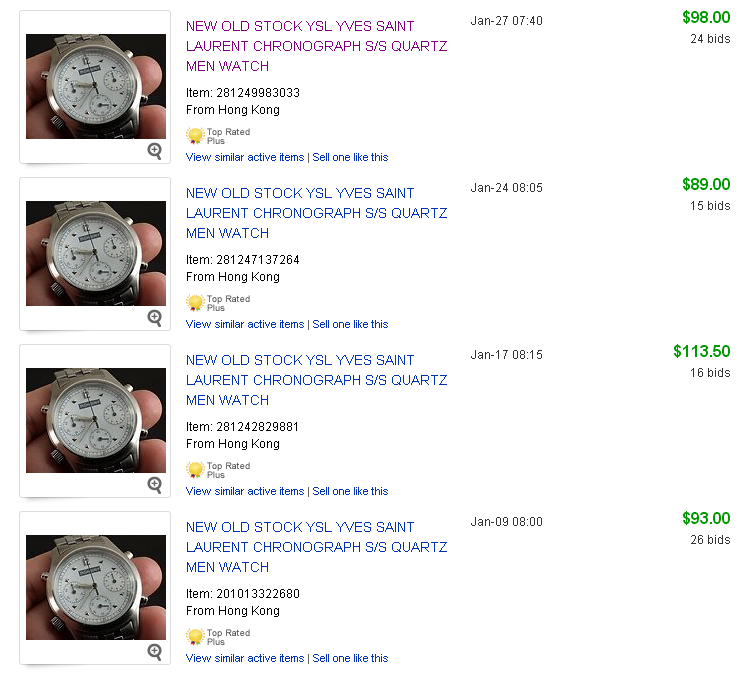 My YSL Yema N7 arrived yesterday - and apart from the fact I paid rather more for it ($107.50 - the second highest price compared to the previous ended listings we've witnessed) I'm rather disappointed with it. 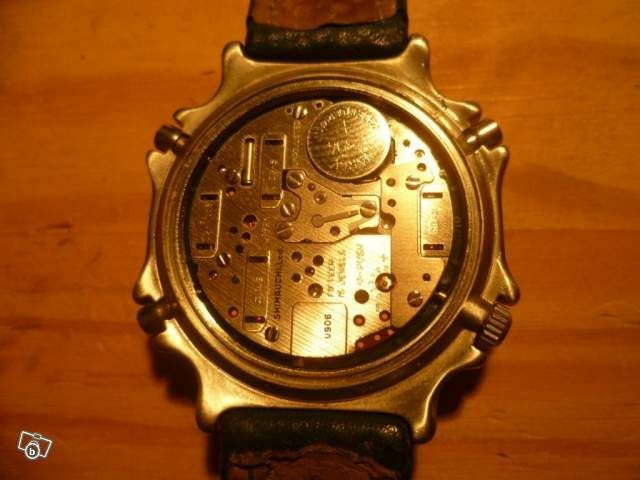 Not just the watch in general, but the received condition. Here's a rather dark and dingy Q&D wrist shot I posted in the WRUW thread this morning - just as it had started to spit with rain again. Probably not that easy to gauge from the wrist shot above, but compared to most 7Axx's this watch is tiny - only 36.0mm in diameter. 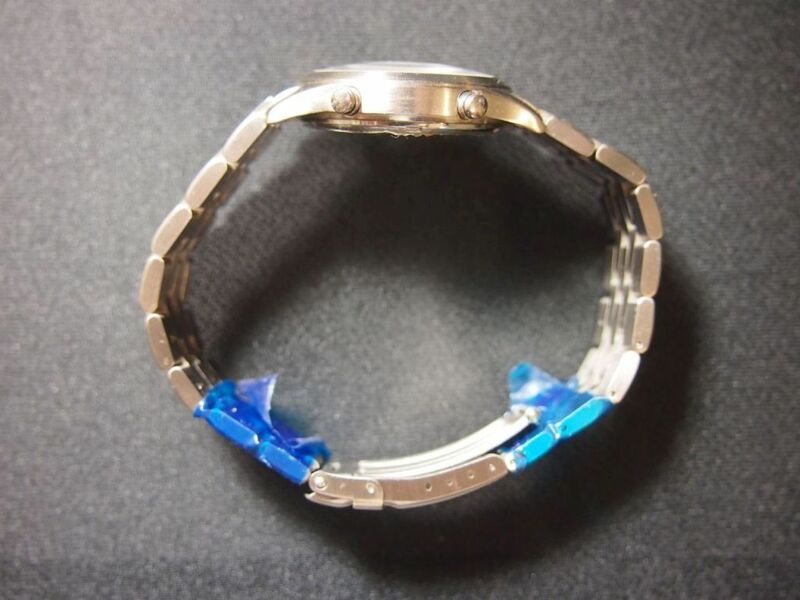 The chunky solid link 18mm bracelet seems quite at odds with it - especially when you're used to flimsy Seiko folded link bracelets. 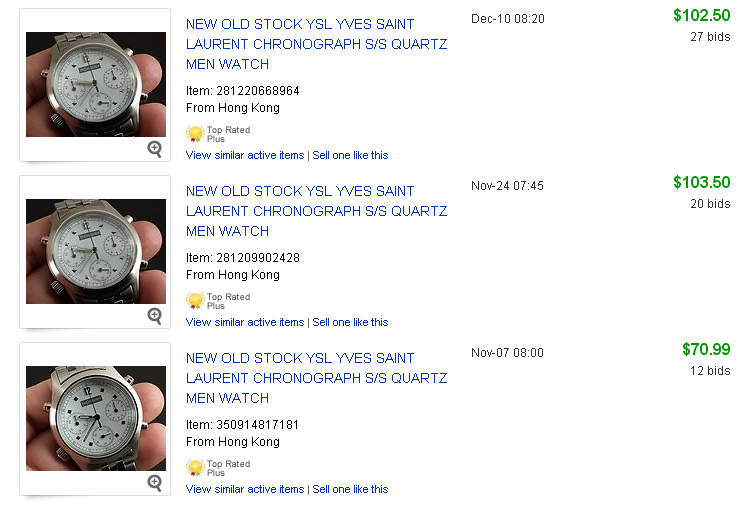 The good news is that these YSL branded watches being sold by Hong Kong eBay seller Neverstrong are definately not fakes. I must admit I had my reservations, especially when I saw some of the other looky-likey iffy branded watches they were selling. No - these are genuine NOS previously unsold stock, presumably dating from the very late 1980's or more likely early 1990's. 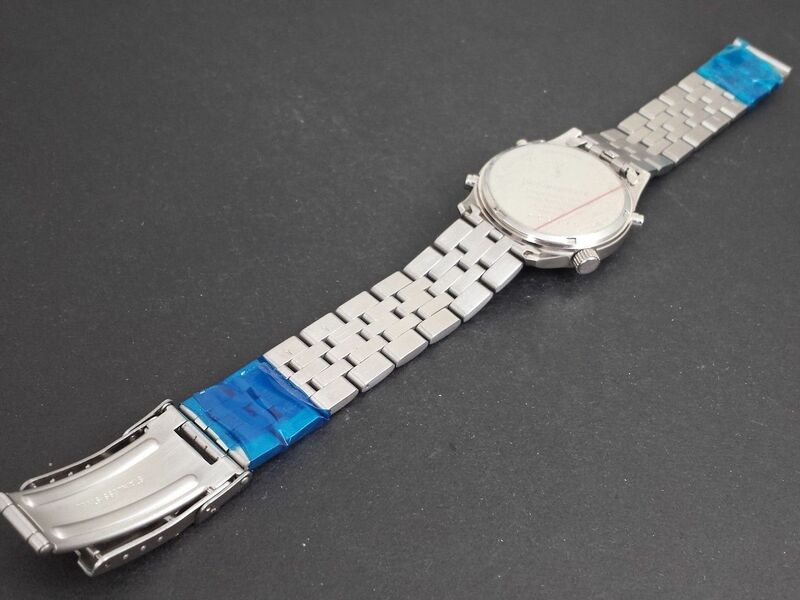 Besides, not even the cleverest Chinese replica watch manufacturers could fake some of what you're about to see. 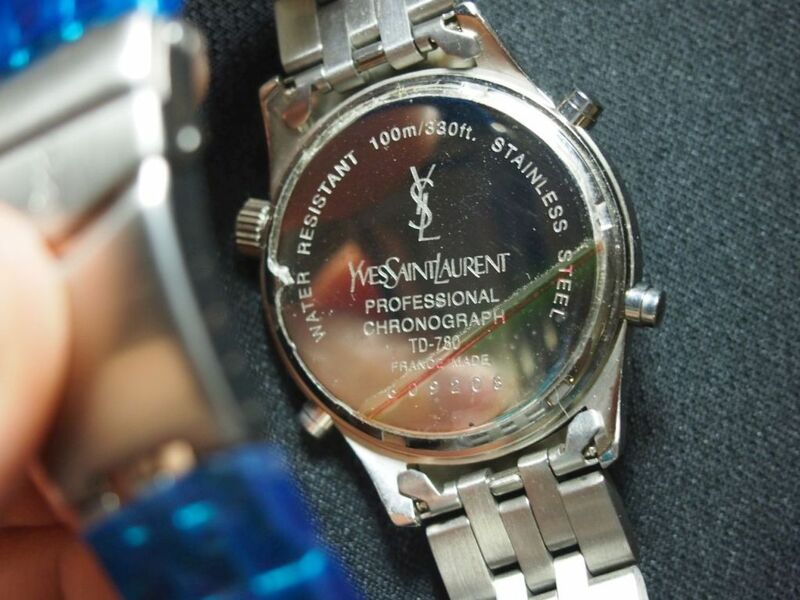 For one thing, cheap replica fashion watches from the Far East will often have the same serial number stamped on them. Earlier in the thread, Paul (PHK) in Las Vegas and I had discussed the case-back engraving. As you can see from my flash-lit photo it's very nicely done and quite the 'pukka' thing. Here I'd removed the protective sticker and given the case-back a wipe with a soft cloth with a dab of lighter fluid on it, to remove most of the sticky residue. That's a reflection of the Ronsonol tin you can see between the words STAINLESS and STEEL. 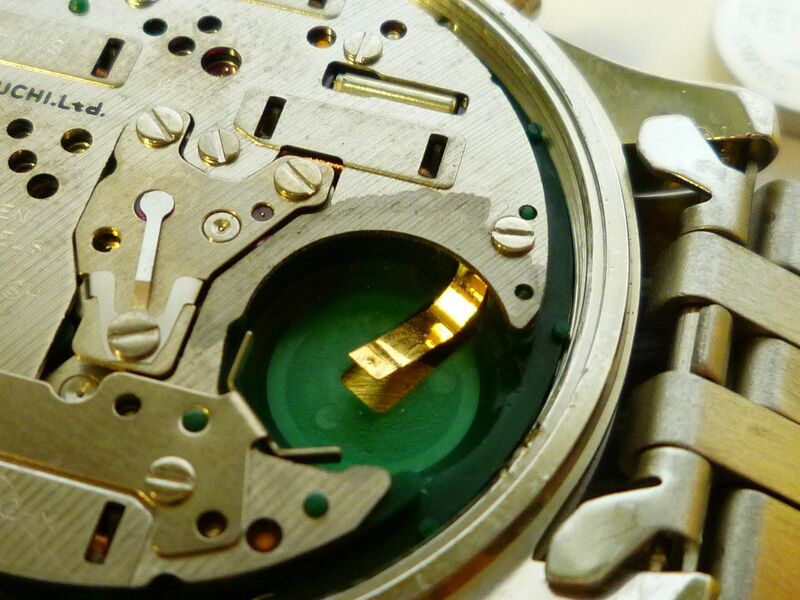 Unfortunately, in the same area of the caseback perimeter you can see some 'additional engraving' added by some ham-fisted oaf - slipped tool marks that run almost the whole way between two notches. There are two other matching graunches. 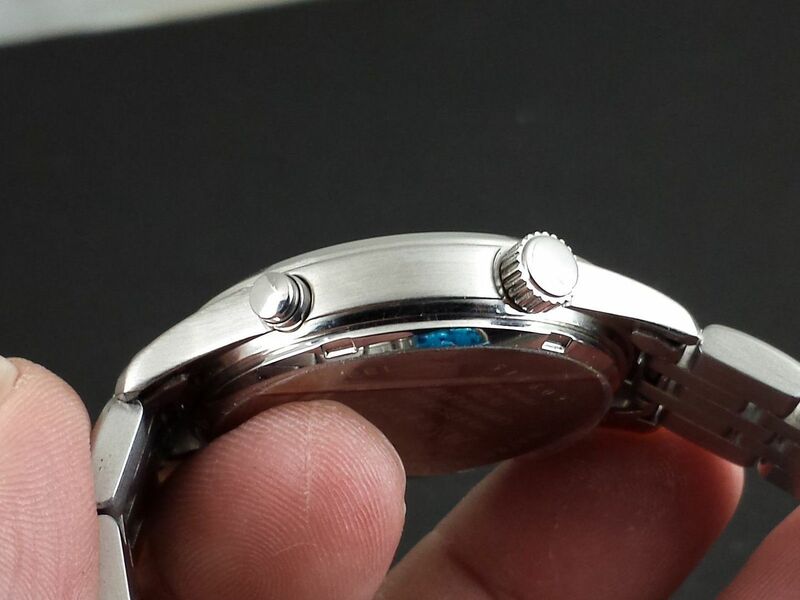 Fortunately none of them extend beyond the case-back onto the watch case and the area with the engraving is pristine. So as they'd obviously expended a considerable (wasted) physical effort unscrewing the case-back, I expected it to be on tight. But No - it unscrewed quite easily with one quick twist of a sticky ball. But it was completely blank - so I didn't bother taking a photo. We already knew the movement would be printed Shimauchi Ltd. V905. What I didn't expect to find was some nasty staining on the back-plate - evidence of an old battery leaking - presumably the original that had been left in there 20-odd years. 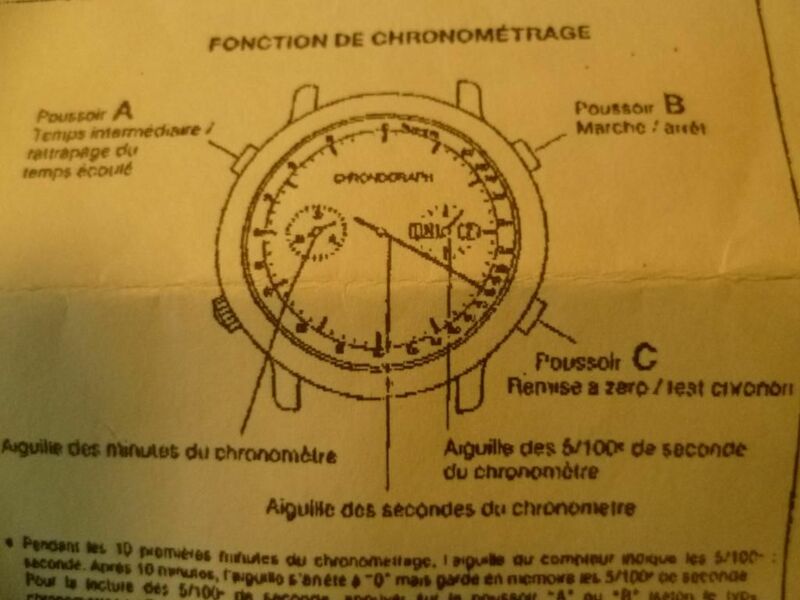 This probably explains why in the photos we've seen of two examples, the lume is slightly degraded; the seller mentions the (98% NEW for dial & hands only) condition of the hands in their description. On mine they're fine. Note also that the seller had fitted an undersized # 395 battery instead of the correct # 394. Here's a close-up shot of the battery well. The gold-plated negative terminal has obviously been scraped clean of sulphate deposits. At the weekend I plan to remove the back-plate, clean that stained area and check that there's nothing nasty lurking underneath. Other than my Q&D wrist shot, this morning, I haven't taken any shots of the complete watch. There's plenty in the thread already. 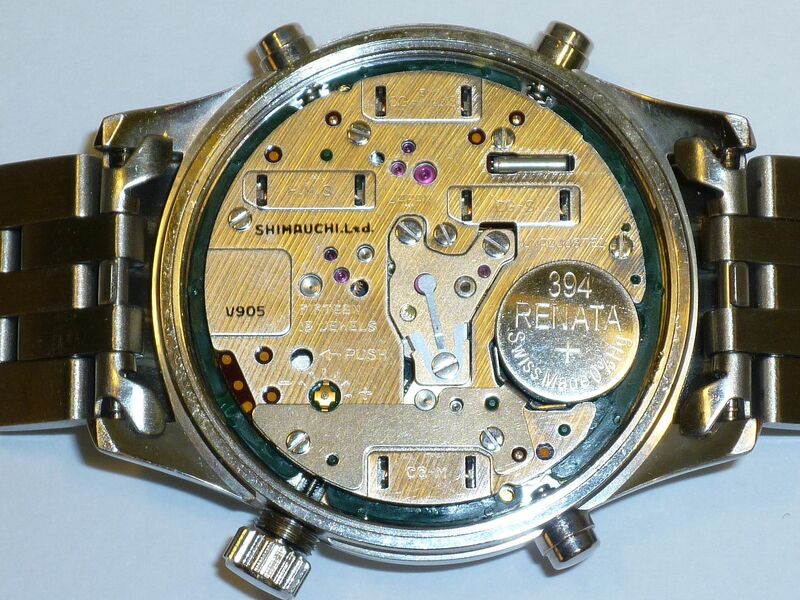 I instantly recognised those short sub-dial hands - they're another Seiko / C.G.H. parts bin component. 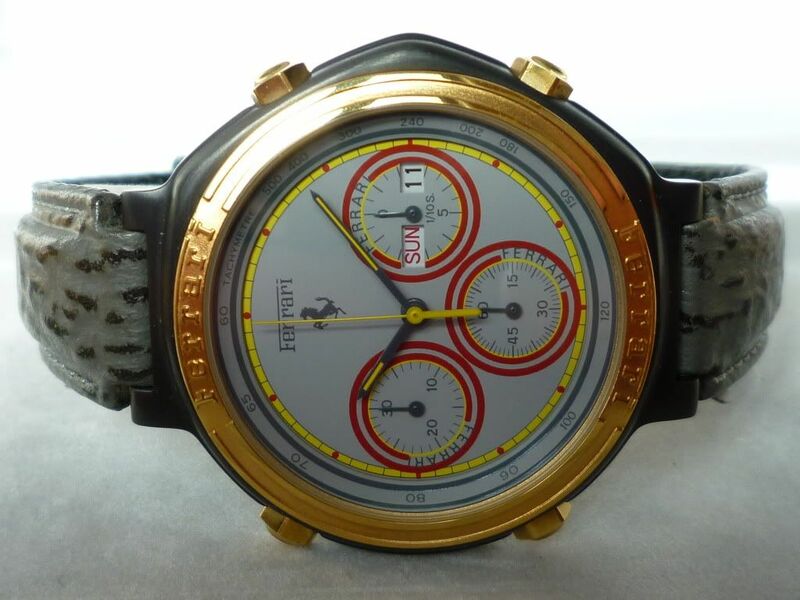 They're also used on some of the Cartier Ferrari Formula chrono's like this one of mine. Except on that watch they're painted dark grey instead of black jappaned. As I've already written, IMO, the chunky solid link bracelet is also at odds with this little watch. 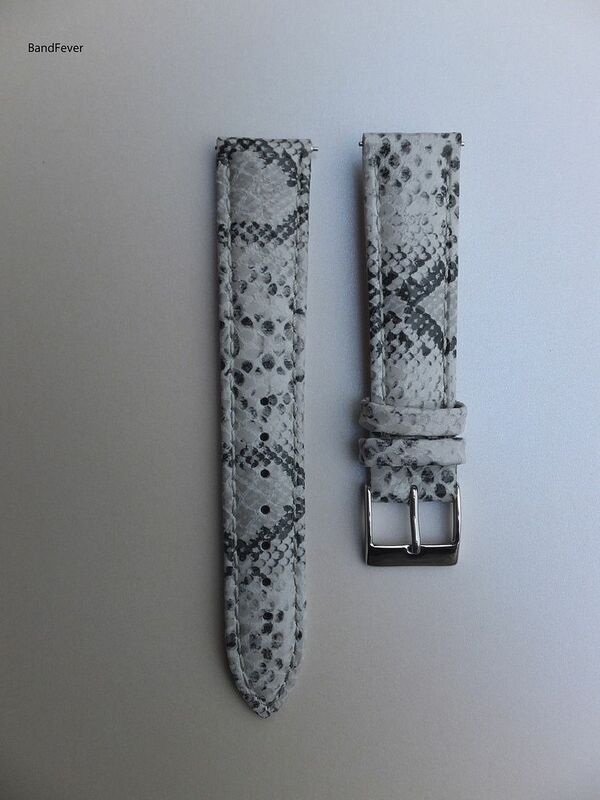 As supplied, it's also very long and would probably fit an 8½" wrist. I took out 3 adjustment links to reduce it down to fit my 7½" wrist. What surprised me was that the adjustment links were held in by weedy 0.8mm diameter split pins (rather than say 0.9mm or 1.0mm). 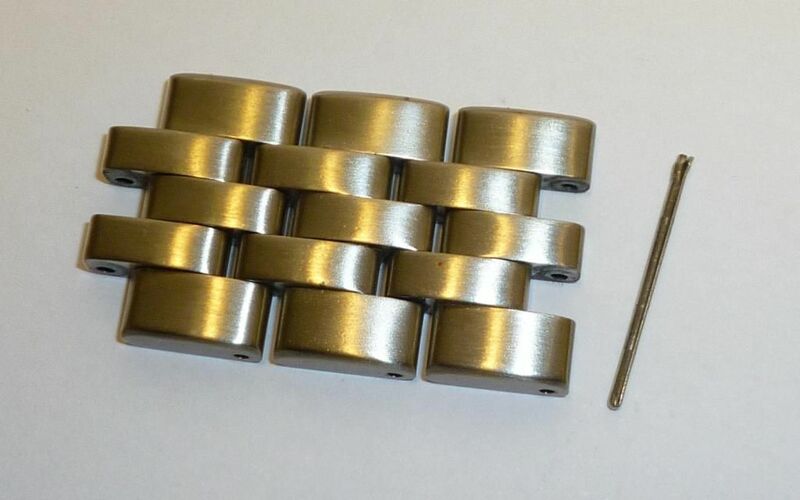 Goes without saying this bracelet (however solid it may look) is held on by the usual pressed end pieces and 1.5mm Ø spring bars. Probably not so apparent from Neverstrong's photos, but the crystal is quite pronouncedly domed. 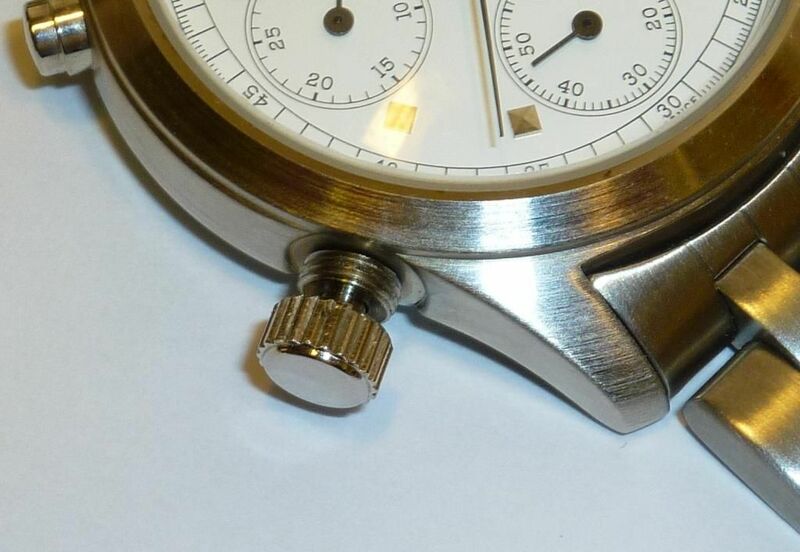 If you look again at the Russian watch forum seller's photos you can see he included a side-on view. 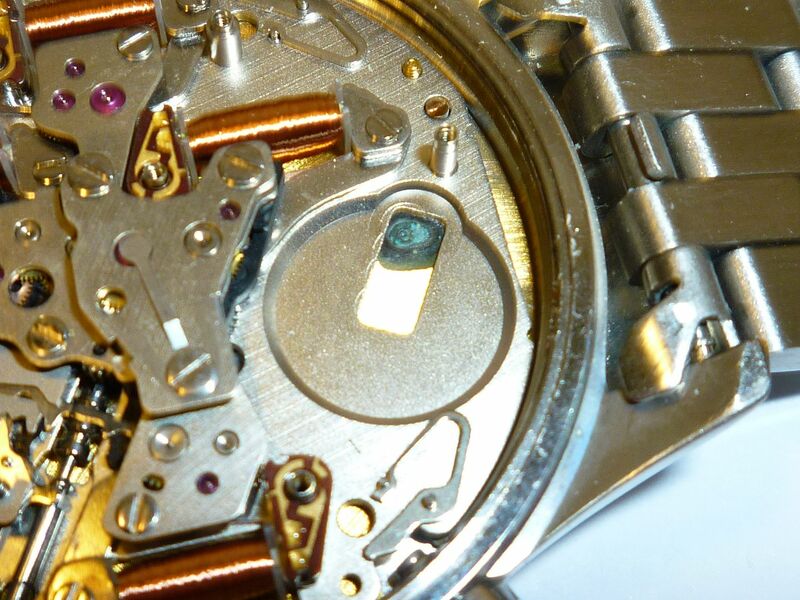 This crystal produces some distortion as you turn the watch towards the horizontal, so I'd suspect it is flat-bottomed rather than double-domed. So, apart from the faults with the example I was supplied with, you can probably gather I was less than enamoured with this little watch. Which in the circumstances I bought it, makes it even more of a disappointment. 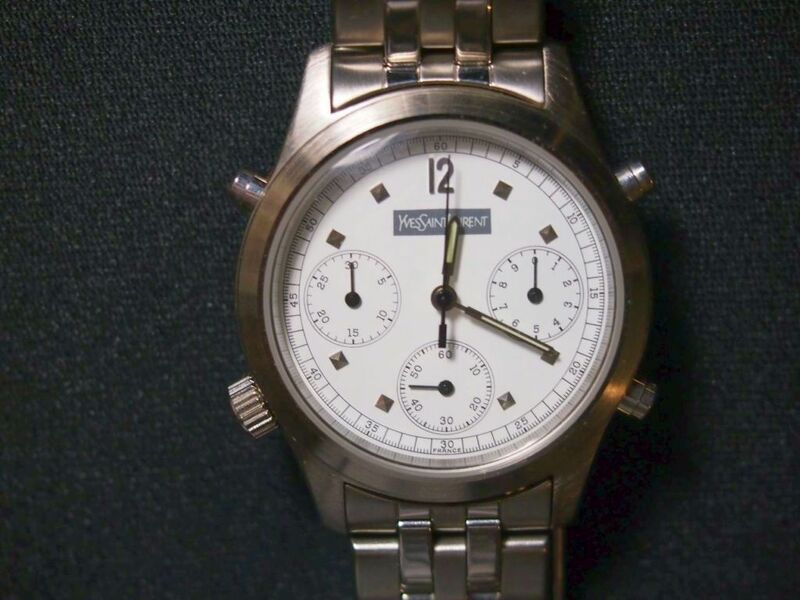 You may have seen Fabio's post in the WRUW thread this afternoon: Looks like a woman's watch, what do you think? Well that's exactly what I thought, when I first saw it. An ideal little lady's watch. Other than for 'research purposes' (I don't do 7A28's, remember) I didn't get it for myself. I bought it with a lady friend in mind. And this particular lady tolerates (if not encourages) my watch collecting habit. Tomorrow being Valentine's Day and all that, I thought it might make a different sort of gift - something more lasting than flowers. 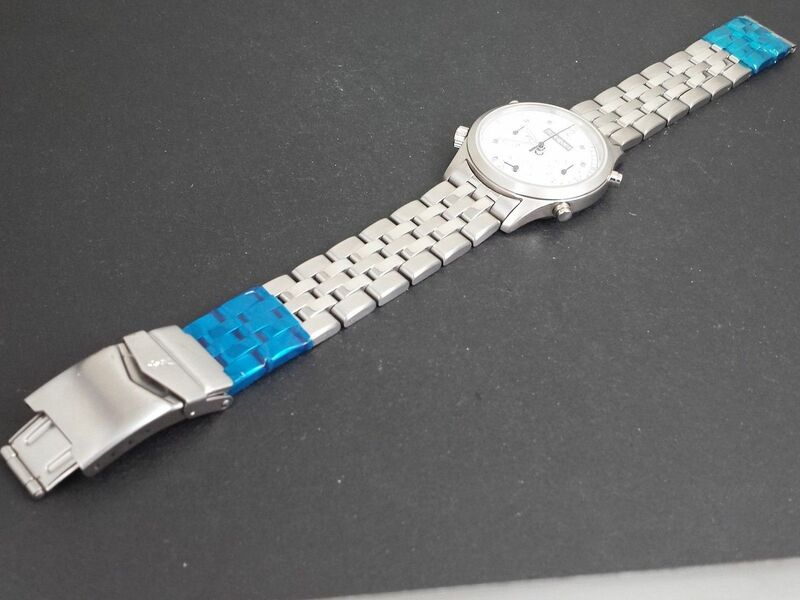 My original plan had been to order a leather strap for it, to make it look even more 'girly'. I was thinking White Baby Python, like this. But now I'd be something of a hypocrite giving her this watch tomorrow, when I'm not happy with it myself. Or headed for the Members Trading Area. 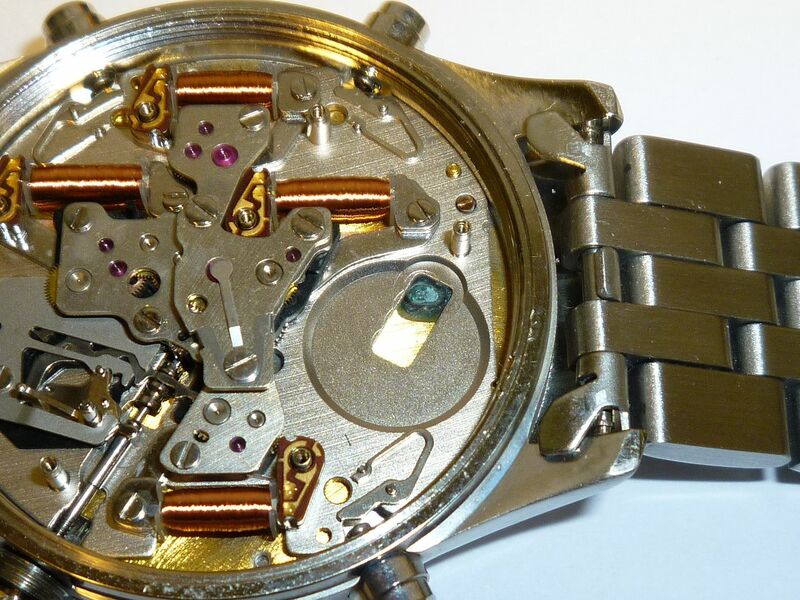 Anybody looking for a not so cheap 7A28 movement donor ? Meanwhile, I've invested in a dozen red roses instead. They usually work best, anyway. The anti-magnetic backplate came off cleanly, as did the PCB with not a trace of any battery acid damage to either, thankfully. But then, after I'd removed the gold-plated battery negative terminal, I noticed something odd looking in the base-plate cut-out. 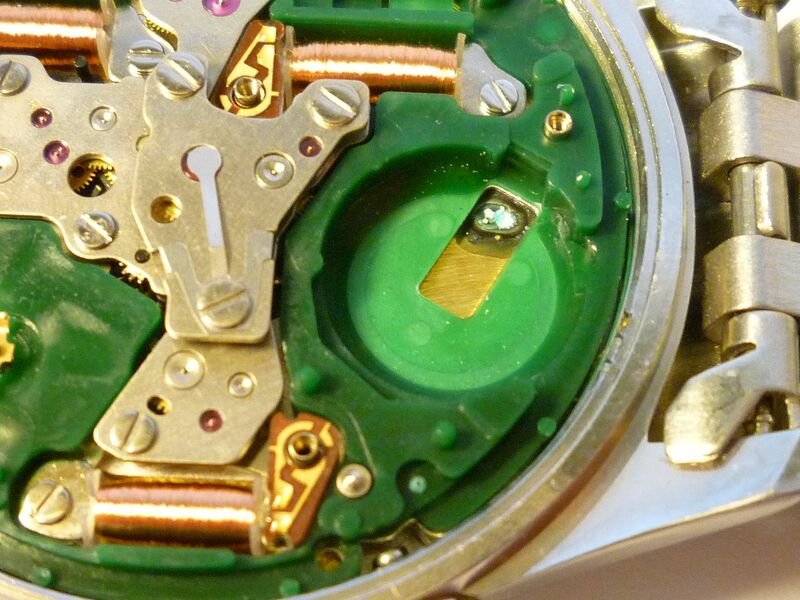 At first I thought I was looking at the corroded remains of some hitherto undiscovered 7A28 complication. Of course, there isn't one. So to get a closer look, I popped off the 710 plastic spacer (which doesn't have 710), and tried (not very successfully) to zoom in on it. Nope. It's just where battery acid gunge had dripped off the underside of the negative terminal and eaten into the brass dial plate. I was a little bit wary of poking it too much, because what I reckon I'm looking there, is the end of the lower rivet of 1 (12) on the dial. I cleaned up up best I could, with the movement in situ, cleaned up the negative terminal and back-plate and nailed it back together. You can now read 'UNADJUSTED' under the CG-S coil on the back-plate where before there was a stain. Correct # 394 battery fitted. 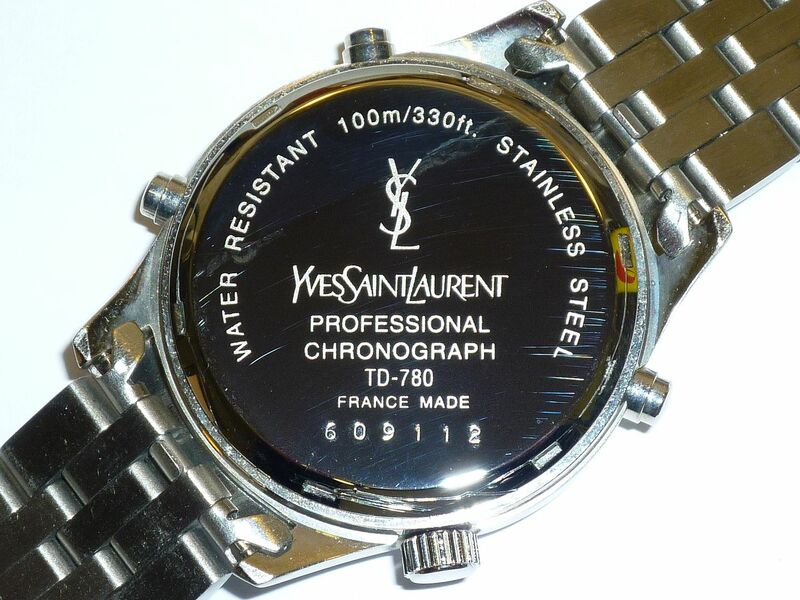 OK Paul, I will will be looking into my YSL, checking for any leakage. I'm in Portland and see that YSL has arrived at my home. I'll get to it Tuesday next week.